Looking for any info pertaining to. My grandfather ElwoodWINDY Daley. Speaking of the late, great Rich Senneker, his son Rick just won the outlaw late model feature at Kalamazoo Speedway last weekend. no easy feat against the quality of cars that compete at that place. I'm sure his dad looked down from above and was very proud. Correction. Supermodified. I was in attendance that night. I also remember a winged sprint car race, where Rick Ferkel brought everyone to their feet during hot laps. He never lifted for about two laps. To Gene Klabak, and others. I have the original Owosso Argus Press article, and photo from the world record set by Page Reynolds in his superfodified. Been making the rounds to some of the local short tracks and while at Owosso a few weeks ago I saw Rick Sigsby. For those of you who don't know who he is, Rick is the author of an awesome book titled Living on the Edge, a History of Auto Racing in Michigan. I bought the book when I saw him at Owosso and it is very interesting as there are chapters from interviews with numerous Michigan drivers. Stories from Brad Keselowski to Bob Senneker to Jack Goodwin to Joy Fair. For any of you who are interested, he has the book for sale and is doing appearances thru-out MI at local tracks. It is available also by going to www dot rsigsby dot com. I think it is well worth the money and great mentions of MI history. Thanks to WaterWinterWonderland for this site giving us the ability to share info like this with the racing community. what a great site you have. I will be submitting pics of tracks very soon! thanks again. Owosso Speedway NEEDS YOU Due to extreme financial circumstances, the Owosso Speedway could face being shuttered if the next two race weekends are not HUGE We need each and every single one of you reading this to make the trip over to see some of the best racing in Michigan, before it's too late This Saturday, August 18 will feature the Modifieds class, one of the best in the state of Michigan, it is also Autograph Night Adults are just $12 and all kids 15 and under are free. Does anyone remember when Randy Sweet brought his big side board wing car to Owosso to try and set the World's 1/2 mile track record. What year was it and what time did he run?. does anyone remember a pace car that was used at the track in the 60's,,,it was a 46 pacard that was custom design? would like to see pics or info on this car. hay im a big fan of owosso speedway i spent alot of time there in the 60s my dad and harold brent drove the # 25 & 26 55 chevy & 56 chevy there / if anybody has pics of this car please email me the pics email me at rken38@netzero. com /thank you. Wanted photo of paige reynolds when he ran at Owosso speedway. This was one of the many tracks that my father dragged me along to in the 70''s. He was a big circle track guy, having been close friends with a fellow named Sam Sessions before I was born. He also knew the Joncocks, Johnny Grudinski, and Johnny Logan (who just passed away recently). Anywho, he was always takin'' me to places like this when I was a little shaver and I guess that''s why I like racing (though I prefer drag racing). I don''t remember when it was that I was last out there to watch a race. I seem to think of it as being a half mile track back then because the cars would get farther away from you than like at Spartan or other little tracks. I think it was paved. I do remember one thing; they were having a bus race that day. My dad really didn''t care for that. He thought it was silly. Boy that was many moons ago, but yet it was only a little while ago, you know?. Nice track, rebuild the 1/2 around the 3rd and put in a real fig 8. Thanks for your interest in Owosso Speedway. I am one of the group of 4 that purchased Owosso on July 1st 2008. We are very encouraged by the number of racres that have returned to this great facility. We have high goals set and hope to restore Owosso to a place of greatness in the Midwest United States as on of the premier asphalt shows to see. Thank you for your support!Jeff Parish- Sept 15th,2008. Rich Senneker died June 1st, 1973 in a fatal crash at Owosso. Here is a link to his story - http://www. historicracing. com/drivers_died_year. cfm?driverID=7894&decyear=1970&died_year=1973&. I''ve been trying to collect information and photos in an effort to put together a biography of the late Rich Senneker (older brother of Bob and Terry). I understand that he unfortunately lost his life while racing at Owosso back in the early ''70''s. Does anyone out there have any details about that incident, including the exact date it occured, etc? Thank you in advance for any help you might provide. Owosso is changing hands. They should go to Sundays as AC and Dixie do Fridays and saturdays. I just wanna say thanks to dave and Ron for giving it a try. I had some good times there and it is truly a great two groove track. From the Owosso website. 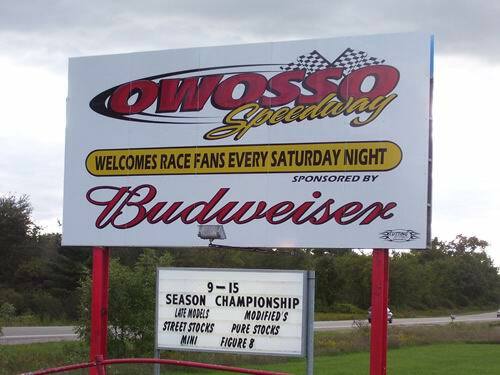 As of July 1, 2008 Owosso Speedway will have new owners. Jeff & Pam Parish and Rick & Jennie Miracle have purchased the speedway, from Bighause, Inc. They will take over ownership responsibilities on July 1, 2008. Ron and I want to say Thank You to everyone for there support over the last 5 years. 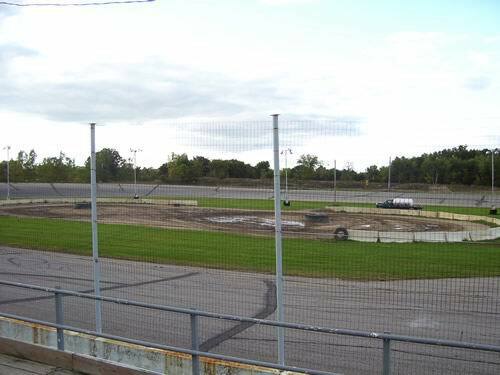 We strongly feel this transfer of ownership will be Great for Owosso Speedway, and for each of our own personal lives. Itâ€™s been a fun ride and we donâ€™t regret one day as ownerâ€™s of the speedway. We have learned much and developed a lot of great relationships, with many good people. For that, and all of our many Blessings from God, we are extremely Thankful. Please welcome and continue to support our new owners of this track we love. We invite everyone to come out this Saturday, June 28th, 2008 for Bighause, Inc. Last Show. It will be an awesome 75 Lap Super Late Model Show, MCR Dwarf Cars, Pure Stocks, and Mini Stocks. 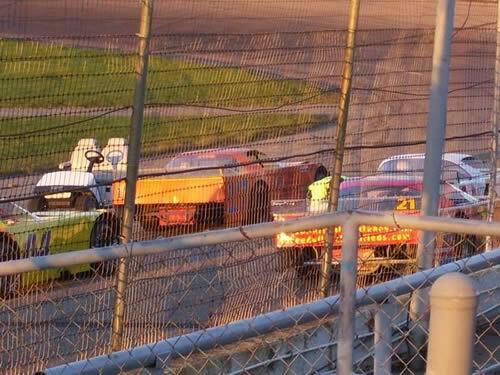 Speaking of safety, the faster tracks like Toledo AC and Dixie should all install the safer barriers. One of the coolest things about Owosso is the lack of concrete walls at the turns and backstretch. Also after the Ron Allen fire at Toledo, someone please tell me why these track safety services don''t roll a small purpose oriented and dedicated fire rig and not just a pickup truck with fire extinguishers. Race cars are a lot like airplanes. If I owned a track safety service co that would be my big selling point. You don''t need it often but when you do, you have to have it. Ask Ron Allen, he almost died. This is from Speedway Safety Inc. regarding there services at the big O. Speedway Safety Inc. is sad to announce that it will no longer be providing its services at Owosso Speedway this year. The news came on Monday 2/12/2008 that the Big O will be contracting its own people to provide Fire, Rescue, and Track Cleaning operations this year. Dave told us that it had nothing to do with our level of service, but boiled down to basic dollars and cents. We tried everything we could do to create a situation that could benefit both parties, however an agreement could not be reached. Speedway Safety Inc. would like to thank Bighause Inc.
for the opportunity to serve at Owosso Speedway for the last several years, and we wish them the best of luck in their endeavors. Also, we wish the best of luck to all of the drivers and friends at Owosso Speedway that have supported us over the years. It''s been a good run, and hopefully we will see you all again someday. Seeing things like this are not a sign of progress. This is very unfortunate for Owosso and SSI. I only hope the level of safety and track services provided by the new staff will make for a safe environment for drivers, crews and fans. Since that should be the #1 concern for all involved. 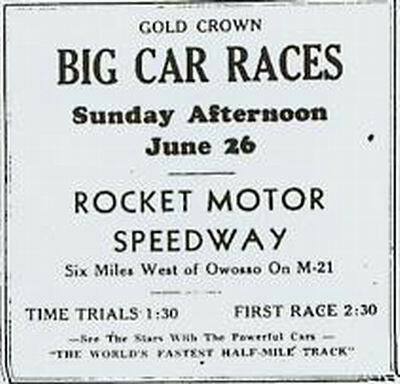 OK, here is a bit of history that I dug up about Owosso:The track opened as a 1/4 mile dirt oval on September 12th, 1941, and operated into 1942 before closing for WWII. The 1/4 mile dirt oval reopened on or about August 28th, 1946 and operated until 1953, when apparently it was paved, continuing in that form until 1983, when the pavement was apparently removed, which lasted until 1988. 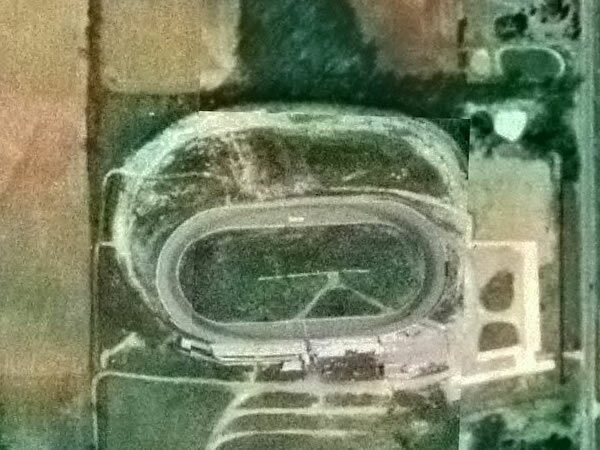 A 1/2 mile dirt oval opened on September 16th, 1946 and operated until 1960, reopening in 1963 and continuing until 1972, when it was paved sometime during the season. The paved oval operated until 1982, when the pavement was removed for the 1983 season. The 1/2 mile dirt oval reopened on May 19th, 1983, and operated until 1988. The modern 3/8 mile paved oval opened on July 31st, 1988. 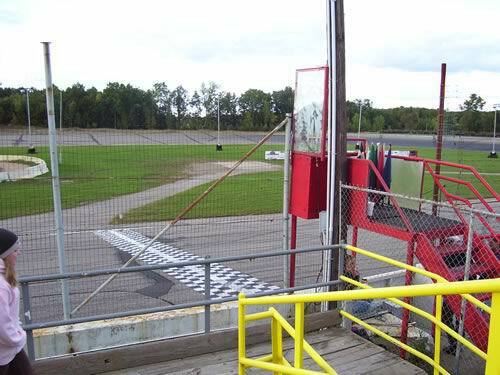 This track has also operated as Gale''s Sports Arena, M-21 Speedway, and Rocket Motor Speedway. The track was apparently the site of some sort of internment or holding camp during WWII. Well. this is going to prove to be an interesting 2008 season for the surrounding Flint area tracks. Here is a piece of info that seems to be of interest as they TOO are looking at Fridays & Saturdays throughout the season (if possible). Here is the excerpt:If things go our way with county officials, the 2008 season will consist of about 60% Friday night shows and 40% Saturday night shows. If this is not possible, we will run 100% of the 2008 season on Saturday night. From the Owosso website. It has been awhile since any one from the tack has posted on the web-site, but we have been hard at work preparing for the 2008 season. The number one project is an attempt to get the county to ease-up on the restrictions that the track must operate under. A Lawyer has been retained, a motion has been filed, and a hearing date has been set for the second week in January. This is the first step; the hearing could show results, or it could be the opening round in a much longer battle. We will keep those who are interested informed via the web-site. At this time we have not firmed up a schedule in the hope that the court will treat us kindly and we will have more latitude in developing the 2008 schedule. Agreed. but better lighting and bathrooms are manditory for racers and fans. Two tracks yes, but recreate the larger oval outside the current one. What michigan needs is a good halfmile or 3/4. Well Owosso is stepping up the game as well (seems as though Dixie has lit a fire under some butts). Owosso has hired Bill Morris as full time Promotor and General Manager. He has a very impressive record in and with short track racing. This could step up there nights as well. Not sure if it will impact Dixie or Auto City, but looks as though Big Haus is not ''throwing in the towel'' as they say on there website. Owosso does need some serious attention in some areas (i. e. lighting and bathrooms are two concerns I see). So this is going to be an interesting s2008 season. 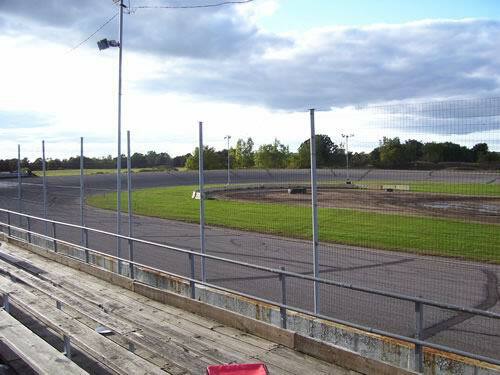 Owosso does have the perfect formatted track, all they need to do is create a small oval on the infield and ''wa-la'' you would have a double-O. tell me if you agree with this. If owosso was still a true 1/2 mile paved, and laid out right (let''s face it dixie''s a bit tight and AC a trick 7/16s at best), fri, sat sun would be a non issue. As it is it is a great track with great racing. 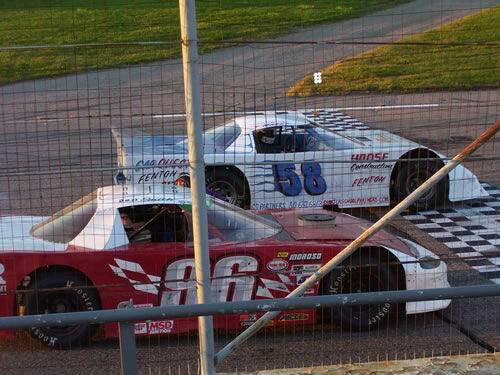 I attended the races this past weekend at Owosso Speedway for there Championship night. I really want to give positive feedback on this experience, but I will say the CONS outweighed the PROS this night. I had checked out the website and it stated the Figure 8 was to start at 6:00pm due to all the racing that was to take place. So I called the track Saturday to re-confirm and the message stated the figure 8 was to start at 6:30pm. I thought ok, I will leave two hours before to make sure to get there in time and get a seat. Well I arrived I could not believe the parking lot as it was very scarce. I walked up to the ticket window and the gentleman working the window was the most pleasant ticket person I have ran into at a track (any track). Cost was only $12 and I even questioned him on that (as I thought it was too low). thought that was great for a championship night. I paid and went in. well no problem on getting a seat, plenty to be had. I sat to the left of the Flagstand and ended up being right in the middle of a drivers family and friends. Pat Stanley (led sled driver) was his name. Very nice guy and his family was as well. Not sure why, but as I listened to The low Spark of High Heel Boys play over the PA.
(I was almost put to sleep) the racing did not start till near (or after) 7:00pm. Thing is, there was NO reason explained by there announcer or any indication of what was going on. Well, they brought out the 4 cylinders to start the night off and I asked Pat Stanley, when are they going to run the Figure 8? He said NO CARS SHOWED UP TO RACE. Very interesting as there was NO MENTION of this on the message machine or by the announcer that this was canceled. Thought that was kinda inconsiderate (not that i was there just for that, but it was ADVERTISED and I am sure they had to know at LEAST THAT DAY). The races started and when it got to the supers, they halted the racing due to the SUN BEING IN THE DRIVERS EYES (totally understood for safety reasons). They held the racing up for about 15 to 20 minutes to let the sun set. First time I have ever seen that (do they do this every Saturday night?). They restarted the races and have to say, the turnout of competitors was bleak. Only 13 to 15 cars per Street Stock/Mods/Supers for the features and 5 for the 4 Cylinders (and one of the Street Stocks was Larry Plamadon #81 Camaro). I ended up leaving at 11:00pm with only 3 laps into the Mod race as I could not take the cold and I still had the drive home to do. Oh, and there were still that race AND the Lead Sleds to go. Overall. Owosso really needs to pay attention. So many things could have sped up the program. And the (very young) announcer needs to be much more interactive and informative. No disregard to him, but they need a person with some background in racing to be more interesting. Also way too much down time and dragging. Again, I see many EASY (and I mean EASY) improvements for this track, but again it would take an open ear and someone who is willing to think outside the box. *NOTE: Kelly in concessions, the ticket box personnel, the ticket-taker, Pat Stanley and his family made the trip worthwhile, but Owosso should think hard about how they operate next year. Heres one idea, how about giving directions on that message machine (or location). I know where the track is and how to get there. but some OUT OF TOWNERS might not. I have much more I could write, but figured I''ve taken enough space up on here. 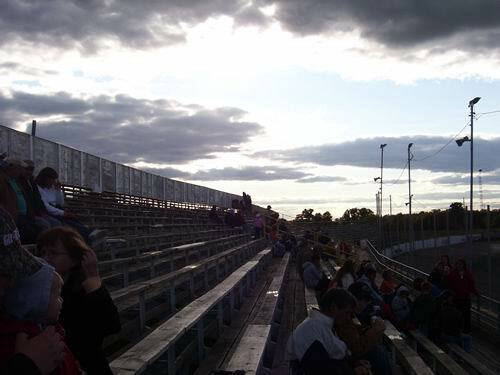 I really hope OWOSSO steps up the program to keep this place open as I do not see (by the fan and car count) a bright future for this track. I have read Dave Bigos''s explainations on the website and give him kudo''s for the information and being straight up on what is going on. Please next year - go out and support this track - thank you!!!. So I keep having this recurring dream that I''ve had for years. I''m in some nowhere place in Michigan or Ohio and I stumble across a long lost speedway and they are racing. It''s all over grown, but the track is mostly clear. I think that is somewhere between owosso and nuncia. Owosso has a charm found few other places. You hit the nail on the head Sean. people have got to know that there is something going on. I did hear about the MC Nat''s thru radio and TV, but even without the big $, tracks can still get the word out. I cruise all over the area and I can tell you I knew about the Lapeer Days, the Metamora Days, State Fair, Imlay City Fair and even a USMA car show at Gibraltor Trade Center (Mt. Clemens, and yes I did think that I was standing on the backstretch area when I was there) without even trying to hear about those events. so the word can be spread. It''s all about marketing. if you have a good product (which Owosso does as a facility and participants) people will want to be a part of it. And it is not all about radio & TV. but there are other methods. Please SUPPORT YOUR LOCAL RACETRACKS weather they be straight, circle or lefty/righty, they need us!!!. one of the best and worse things about owosso is that it is in the middle of nowhere. It truly feels like going to some way out of the way track in the days gone by. I like that Dave doesn''t try and make it all Nascar big britches, he just keeps it simple and real. Springsport is similar I too commend him for trying a track out in the sticks. Sadly, I think this drives home the point about the need to be near a major population base. In any case, this is an awesome track and totally worth the drive, which can be an adventure in itself. And to the other tracks, your promotion is HORRIBLE!!!!!!!!!! To much promoting to people already inside the gate and not enough to the general public. Last night I saw one commercial for Milan Drag way on TV and heard another on the radio. And I watch almost no TV, but they reached me. Racing is a visual and audio feast for the senses. ADVERTISE!!!!!!!!!!!!!!!!!!! I''m tired odf watching tracks die. what is so hard about that, people are not going to go if they don''t know what, when and where you are. pictures work well. I go to Dixie because I have been going to racetracks since I was six and I search tracks out, in the Marc times, through word of mouth and online. I tell everyone I can about this stuff. My favorite thing is finding a track I haven''t been to that I didn''t know about. But I am not average joe q public, and neither are Randy and Nate. You have to tell and show people that don''t know what you do. They don''t have your number, they aren''t going to call you!. I did read that on Owosso''s site. Dave is straight up and is telling it like it is. Kudo''s to him for doing so. I have to say, that is a track that is in the middle of no where and he keeps it alive. bit of a hike for me, even though I''ve done it before. It is the drive home that is the wearing part of going out there. I know that Dave has a determination to keep that track going and I commend him for that. I do hope he gets the support that he needs out there from fans and participants. Owosso needs all the help it can get from the fans and the cars. This is a great little track, and I think Dave tries hard and has always been great to the fans. If you live in that area, which I don''t, please go out and support this great track! Go to owossospeedway. com and check out what Dave has to say. My brothers and I raced at Owosso in1973-1974. Was a 1/2mile outside and 1/4mile inside. Both were paved. We raced in the street stock division. Raced with one (or more) of the Fedewas and a Michigan State trooper who called himself the Owasso Smokey. He drove an old chrysler MSP patrol car. My oldest brother drove a 1968 pontiac catialina, my youngest a 1968 pontiac tempest. I drove a 1969 Blue and white Mach 1 Mustang, #49 (349) as they made us re number it. Was the first place we raced and the last. Had a lot of fun there and made some gas money. Made a few enemies being we were from out of town and even as young as we were we ended a few nights with some heated converstions. Roger Ward was the owner/Promoter then. I have some pictures I will post as soon as I can find them. Just found this sight tonight and it brought back a lot of memories. Hey whats up, my name is Chris Daley, grandson of the late Elwood Windy Daley. all the old timers say he was pretty good and i was wondering if anybody had any info about him. come to the racers reunion at Toledo speedway bar and grill Saturday march 17th from noon to 6pm and with all the photo''s on display,you''ll find some dirt pics from owosso. got some somewhere, just have to find the right album. gary. someone out there must have some dirt track photos before they paved it ?. Owosso Speedway was a 1/2 mile with a 1/4 mile inside. Actually I believe it was more like a 5/8 and a 1/3. The track was always fast. Dirt went away to pavement in I believe 1973. The pavement was smooth and scary. It quickly gained a reputation for being too fast. I started going to Owosso in the early 70's when it was dirt. The track was well oiled an smooth. After being paved and the pavement being later removed the track became rather dusty. Still it was a great track that would be great to have around today. The current 3/8 track makes for great racing and the area around the track is much improved. A guy named Paige Reynolds once went around the 1/2 mile(paved) in 14. 31. This occured in the mid-70's in a supermod. Everyone else that night was in the high 16's. Its save to say he lapped the field a few times. Jim Aldrich won quite often on the pavement in a Superstock. He had the ability to pass coming out of turn 4. One other memory, people used to cross the 1/2 mile to get to the 1/4 from the pits. I think a person was ran over during a midget event and later died. I have many racing videos for sale from Owosso, Tri City, Dixie and Auto City Speedway along with a tape of the 1985 Dealers Choice race at Kalamazoo Speedway and a tape of a Winged Outlaw Midget race at Whittemore Speedway. These videos are from 1985 to 2005. Send me a email for a list of what i have. xlcrmoemoney4@charter. net. Yes, that's what i understand. In fact I read somewhere they were paved at different times, though I don't know if that's the case. I seem to remember another track being paved outside including front stretch first although I read Owosso was 1/3 mile first. Be so cool if the 1/2 was still there. 11/4/2006 - Bill Murawski Jr. In the aerial photo was thier a bigger track here at one time ???. That's a great aeral photo. Wouldn't it be great if Owosso was still a half mile with a 1/3 inside. Does anyone have pictures of Jimmy Wilburn (static or action) in the late 40's, early 50's at Owosso and/or other tracks they would be willing to share or sell ?. I just returned from Bradenton Florida. Had a nice visit with Jack Goodwin. He is now retired and had quite a write up in the paper. They gave him a whole page --with pictures. Some of you old timers will remember he won just about the whole season of features back in the 50s at the Owasso track. Jack drove in some NASCAR races and also in the Mexican Road Race. He finished 3rd in the NASCAR race that was held at the Mich State fair grounds in 1951. Owosso was one of the biggest half-miles around,whether dirt or asphalt. The quater-mile on the inside was paved,while the half was dirt and made for interesting racing as the frontstretch was a combination of both. Easy Ed Jones promoted the place for quite awhile under the CARS banner. Gary Fedewa,who had his first ever race at Owosso was so good their in a Late model that he had a bounty on his head. We spent a few nights after the races there in his sponsor Tri Ami bowls bar. Jay woolworth was also very good at the track, and seeing that Jay still races factory stocks at Auto City, he is a wealth of info on thoses days back when. The supermodifieds were very fast their when it was paved and at one time even ASA paid a visit. Sadly,it was on the paved half-mile that Rich Senneker met his untimely death. As an aside, Ron Dragerand Roy Mott are now the promotors of Toledo, while Sonny Adams has retired to Florida. 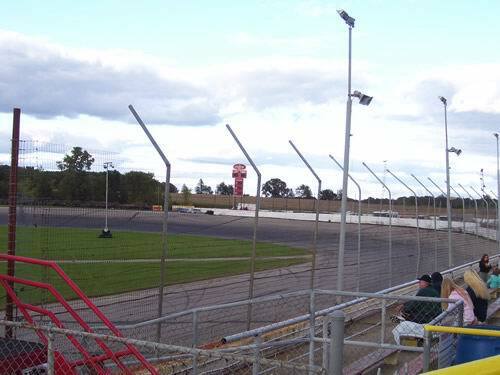 Owosso is one of the oldest tracks in the USA and has seen many highs and lows over the years. The configuration of the track was changed when the Simco family purchased the property a few years back and cant remember the exact date. Every type of car you can imagine has raced on that site. See Ya!. Mr Blume, Thaks for the reply. This Information was taken from the 1981 MICHIGAN AUTO RACING YEARBOOK. Page 54. OWOSSO SPEEDWAY Ovid Michigan. 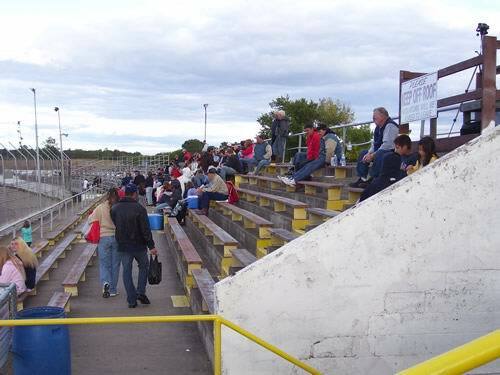 Owosso Speedway was built in 1934, and became very famous during the years after. Some of the promoters in the past few years included Ed Jones, Indy 500 winner, Rodger Ward and in 1979 John and Barb May took over the track. They had previously ran the Mt. Clemens Race Track along with Sonny Adams, Adams at the present time is the promoter of Toledo Speedway in Ohio. Owosso has 1/4 & 1/2 mile semi-banked paved ovals. Saturday nights: Late Model, Sportsman and Street Stocks. Promoters: John & Barb May, 9825 Division, Richmond, Michigan 48062 (313) 727-2229. Announcer: Scott Schultz. Pit stewards: Chuck Moore and James Teague. Flagman: Butch Klotz. Chief scorer: Marlene Klotz. Seating capacity: 3500 And that s what was going on 24 years ago in 1981. At Owosso Speedway. NICE SITE. The track was originally a large dirt 1/2 mile. There was a flat 1/4 mile that shared the front straight. In 1972, Ed Jones paved the track when he joined together with Spartan and Jackson to form a 3 night series for the 1972 season. Besides indiviual track championships, there was a combined cahampionship sponsered by Carlings beer. In 1973, a similar setup was formed with Dixie and Auto City. Im not sure when they did away with the 1/4 mile, whether when the track was put back to dirt or when it was changed to the present 3/8 mile. Yes, they did run the double O race. Did I read somewhere that Owosso originally had two tracks like Mt clemens and also ran the Double O? Anyone know, you can definitely see the remnants of banking in the land surrounding the current track. Randy, I have a picture of Vern in the car he flipped. Vern signed it on the back and said it was taken about 20 minutes before the flip. 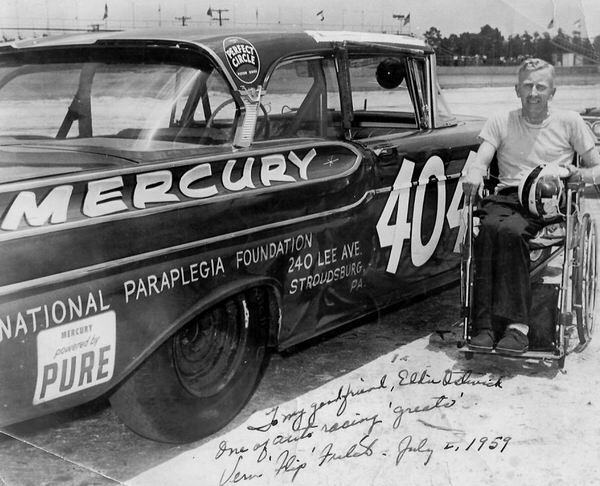 I also have a picture of him with the 57 Mercury that he drove to a world speed record for paraplegics. Vern said that a Russian held the record previously. shandy@provide. 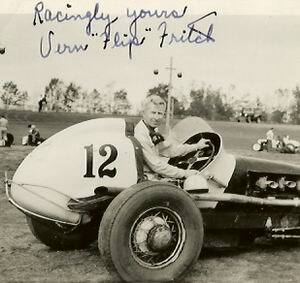 Dan, you are correct about this being the Same Owosso Speedway that Vern Flip Fritch took a tumble. From what I have gathered, the track was built on a WWII POW camp. (I questioned this, and have seen it on another site about the track). From what I have got, the track was built in the mid forties. The date you speak of is exactly right about Verns accident. This track is awesome, just needs more competetors. Does anyone know if this is the same Owosso speedway that was in action in the 40s? I knew, through my dad, a big car driver that flipped at Owosso on October 9, 1949, and was paralyzed from the waist down. His name was Vern Flip Fritch. After his accident he continued on writing for racing newspapers. One of the nicest drivers I have known. Just curious whether this is the same track still in operation after all these years. Does anyone now whats up with the whole Don Wiliamson sports thing. Whats that about?. 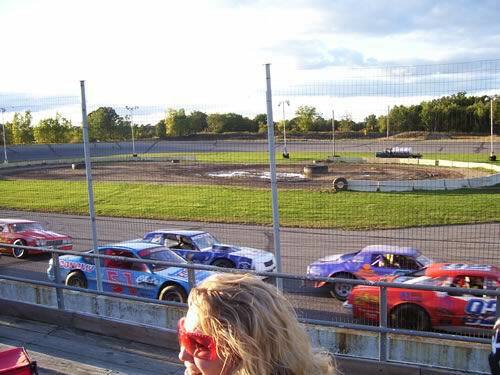 I made it to Owosso Speedway a couple of weeks ago and I have to say, it was good racing. I had been there back in the day (60s/70s) and nothing has changed since. I live in the Detroit area so the only thing was, it is a drive to get there. It was a good night and the turnout of fans looked great. But I agree with Sean, the turnout of cars was under par. Such a good track, fans and upkeep, sad that there are not more competitors. Just another sign of the economys thorn in everyday life I guess. I will return to Owosso, and try to support all local tracks (Flat Rock, Toledo, Auto City, Dixie, etc. ) as I miss the ones that have gone to the wayside. Of course being from Mt. Clemens, that track was the total elite of tracks (both when it was dirt & asphalt). Great site, keep up the good work, go fast, turn left. Some notes on Owosso Speedway. Its a semi banked multiple(more than two)grove 3/8 mile asphalt track. racing is every Saturday at 7 and admission is between 12 and 15 bucks, depending on the show. Super Late Model nights are usually 15. Worth every penny as the last late model race I saw there had cars two wide five rows deep running lap after lap after lap, and I dont mean passing and falling in line, but continuosly side by side and Im not joking! Awesome racing! Track is banked all the way around with decently long straight aways. Great racing. Some of the cleanest most competitive racing Ive seen in a while. Drivers did a great job and there werent a million annoying yellows or check book destroying wrecks. Clean but amazingly tight racing. Great track. Multiple grooves. Love the fact that its banked all the way around so there isnt that awful transition area from the flat straights to the turns that I think is a trap a lot of one groove tracks fall into. Seems like tracks like that might have one good way into and out of a turn. Owosso really seemed to allow for lots of different styles of driving. Need more cars. Dont know why there were no template late models like there were down the road the night before, but if its a rule thing ya might wanna find away to include em cause it would strengthen the field. 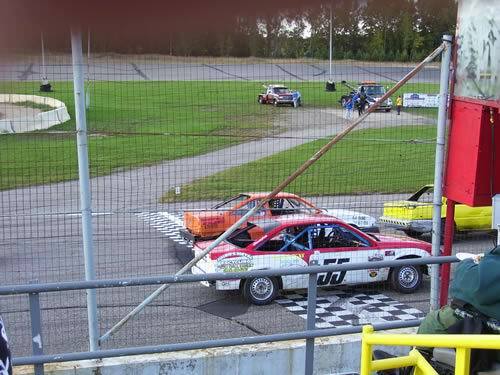 Also, maybe the street stock division would be good to include sportsman type cars cause there were only a couple real factory cars anyway. Nice feel to the place. Although things seemed less than organized at times, the place and atmosphere had a real nice feel to and maybe that was due in-part to the disorganization. Very welcoming and friendly. No one was trying to be slick and pretend the track was Daytona. I especially liked hearing the pit steward getting after the drivers to grid their cars over the pit PA.
Announcer did an awesome job. Like the different kinds of music on the PA too. Who ever through the Rush song in there, kudos to you. Great effort by the ownership to make right a slightly steep ticket price. Good call. Felt like the owner really cared about the fans. Hey we know insurance and payroll is rough. We all get that. Especially those of us that were around when Mt clemens folded (best track ever). Thanks for working with us fans and I hope folks support your track. Ill tell all my Waterford Roadracing peeps to head on over to Owosso. Great Job see you next week for the Super Lates.